Well, a week later and no Osama doubles have shown up, which is probably a good thing. Pakistan has been alternating between blustery protests of “You shouldn’t have done that,” and hiding behind the egg on their faces. The people on Osama’s block have collectively said, “Really, they seemed so quiet, we just thought they were very religious.” Rush Limbaugh was forced to choke out credit to President Obama, but he recovered quickly. We also discovered that the only things we really knew about the mission is that it was in Pakistan and bin Laden was shot–everything we’d been told on the first night EXCEPT President Obama’s announcement turned out to be pure fantasy. Now Obama offered former President Bush an invitation for them both to appear at “Ground Zero,” but George declined because, at least we were told, he didn’t think he was getting enough credit for his effort in trying to capture bin Laden. One commentator said, this was kind of like the guy who didn’t open the jar saying he loosened it when you opened the top. But this isn’t quite accurate. Bush is the guy who screwed it down too tight in the first place and THEN couldn’t open the jar and needed someone else’s help. What can we credit Bush with? Ignoring Clinton’s outgoing advice that al-Qaeda was the biggest threat we were facing? Ignoring Richard Clarke’s warnings when he was head of Cybersecurity? 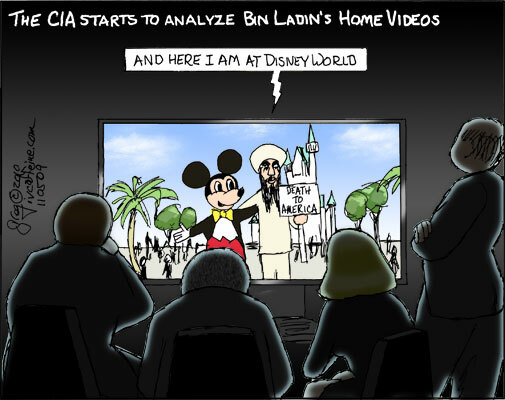 Ignoring the CIA memo that bin Laden was intent on striking within the US and dismissing it as covering their asses? Flying around the country in a panic on 9/11 thinking the terrorists were after him after Ari Fleischer tried to convince us that we had “credible intelligence” that the White House was the other target within hours of our being caught flat-footed? Perhaps turning down the Taliban’s offer to hand Osama over (if we gave them the evidence of his involvement which we didn’t have until he kindly took credit for it a few years later) because they didn’t say “Mother, may I?” Giving up the search in Tora Bora yards from bin Laden’s hideout because it was time to invade Iraq and deal with the REAL threat (koff!) How about seven years of “not finding him” because it wasn’t particularly important and bin Laden had been marginalized, hiding out in some cave in the mountains of Afghanistan–when he was really living in a Pakistan suburb? You’re right. I think President Bush deserves credit for all of those things. Michael Moore and several others, on the other hand, have been complaining about the lack of due process and how we should have brought bin Laden to trial to show the world something or other about justice. Oh hogwash, Michael, it wasn’t a strictly legal mission to begin with. You know, something about not respecting Pakistan’s sovereign territory (like Shep Smith was ignored about). What would holding a trial have accomplished–shown the world that we can hold a kangaroo court as well as anyone else? I mean seriously, even if his defensive team included Abe Lincoln, Clarence Darrow, Johnny Cochran, F Lee Bailey AND Perry Mason, there was a snowball’s chance in hell that a jury could be convinced there was a reasonable doubt that he’d authorized the 9/11 attacks and isn’t that REALLY the purpose of a trial? Did he need a forum to present his side? It wasn’t as if he hadn’t had nearly 9 years of issuing pronouncements that gave the justification for the attack. I agree, in the best of all possible worlds, it would have been a good idea to put him on trial and give al-Qaeda the present of a ceremonial execution or a living martyr in a US prison to inspire them. But we live in this one and a trial would have just been a theatre piece, a ritual piece of mumbo-jumbo to keep the bad mojo off our actions, an anticlimactic last reel that would only have made sense if bin Laden leaped up out of Silver Lake wearing a hockey mask. Be thankful that this part is over. Now we can get back to the REAL problem–getting the hell out of two wars we shouldn’t have been in in the first place. Oh, yes. Thanks, President Bush.